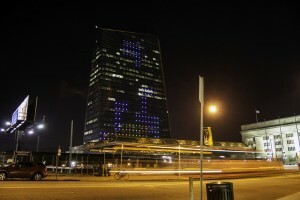 One hundred lucky gamers had the opportunity to play a competitive game of “Tetris” on the side of the 29-story Cira Centre April 4, when the building was transformed into a 436-foot tall “Tetris” board. 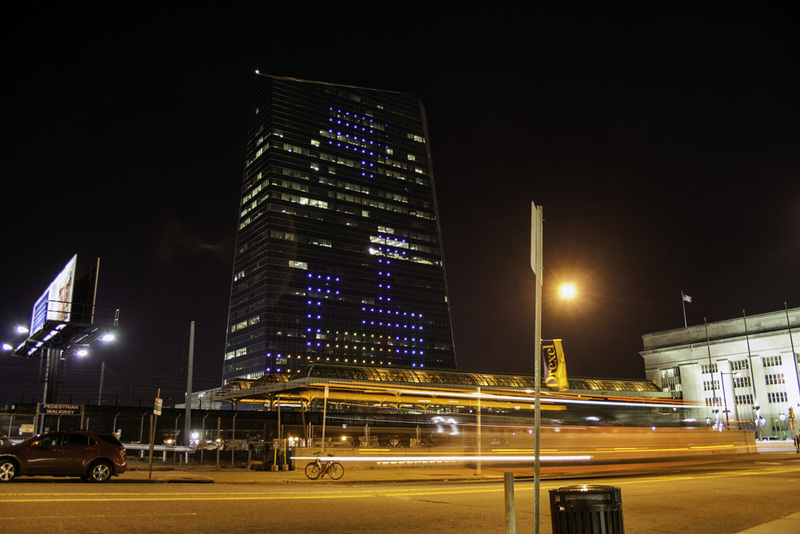 The project, which kicked off Philly Tech Week 2014, was led by Frank Lee, co-founder and director of the Drexel Game Design Program, along with the help of sophomore computer science major Colan Biemer. In a follow-up to his “Pong” project last spring, Lee returned to his original vision that inspired him to combine architecture with gaming. That vision led to the creation of skyscraper “Pong” in 2013 and this year’s “Tetris.” However, Lee’s goal was more than simply transforming classic video games to be playable on the side of a building. “My artistic vision was to create something, an event, that will bring the entire city of Philadelphia together,” Lee said. That goal was only half met the first time around during the “Pong” spectacle, since only one side of building featured the game. Lee made sure he corrected this shortcoming in the design of “Tetris,” which incorporated both the north and south sides of the building in a competitive multiplayer game. Biemer approached Lee before the project started in search of game design work that would supplement his classes. He initially began working on an iOS project. Lee took notice of Biemer’s skills and initiative, and recruited his help for the “Tetris” project, which required knowledge of the computer language Python. Biemer used the original “Pong” code written by the previous team as the basis for his work on “Tetris.” Due to time constraints and the sheer scale and novelty of the “Pong” project, the organization of the code with which he started left something to be desired. “That was probably the hardest portion — just the initial figuring out what everything is doing and how it’s happening,” Biemer said. This challenge by no means deterred Biemer, who even worked on the code during a vacation to Paris in March. He continued to work until he produced a final project with which he was satisfied, a feat that took multiple rewrites. In addition to the code itself, Lee explained the unique challenge of having a live audience, which is not a challenge familiar to the gaming industry. “In this case, when things go wrong, there are nine cameras pointed at you, about a hundred people looking at you, and that was what happened on Saturday,” Lee said. Initially, Lee planned to run a cooperative “Tetris” in addition to the competitive matches, in which one player would control the left-right movement and another would rotate the pieces. However, it did not work out due to technical difficulties. When asked about what he has in store for next year, Lee revealed that he has a few ideas, but he has yet to set anything in stone. “I have some conception of what I want to do, but nothing has gelled at this point,” Lee said.